It's also clear that it's playing off the theme of jazz within the text to fit the opening theme. The text is actually merging the definition of "Bebop Jazz," a genre of jazz, with made up text. The first section talking about musicians gathering at Harlem is talking about bebop jazz, which was controversial at first because of it breaking many conventional rules of jazz. The second part talks about the spaceship name "BEBOP," which is fitting because the bounty hunters have to break conventional rules, like bebop musicians had to, for more freedom. 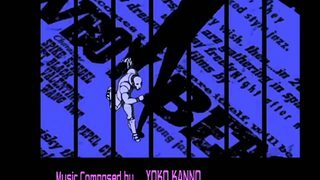 The text basically explains why the anime is called "Cowboy Bebop," since the show revolves around these bounty hunters that have to break rules like the musicians back in the day.